You may or may not know this, but illegals often come ashore in small boats called panga boats. 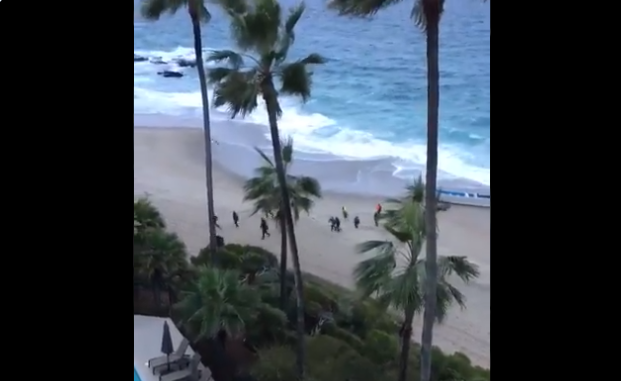 Such was the case at 7:00 a.m. on Thursday, when a small boat “washed up” on shore at Laguna Beach, California. Thirteen people ran from the boat, as residents called authorities. Seven people were detained including two human smugglers who had been waiting in vehicles to pick them up for a total of 9 people detained. “They saw two men running for the cliffs. Officers were on scene in five minutes and immediately detained the two men who had ditched their life vests on the sand.” Border Patrol agent Vincent Pirro. The panga can hold up to 15 passengers and a video taken by a resident appeared to show 13 men running from the boat. Border Patrol agents also seized nine gas cans and 13 life vests. There were no drugs on board, Pirro said. …Panga transports are organized by criminal smuggling operations and single transports can cost $13,000 to $17,000, Pirro said. Therefore, he said, it is unlikely that Thursday’s landing is connected to the migrant caravan at the Tijuana border. The other 6 illegals are reportedly still at large.